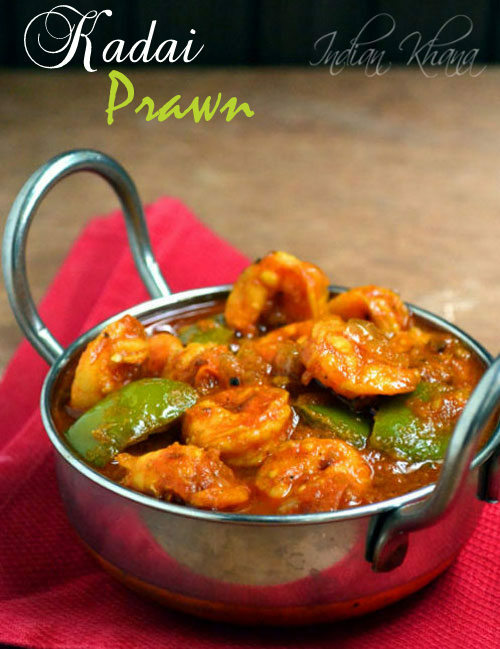 I have been posting quite a few Prawn Recipes which is high for my standards and here is another one to add into the list. My brother likes prawns and he asks me to buy prawn whenever we visit Mustafa, you might think why only mustafa it's because there we get fresh, cleaned prawn which saves my effort and energy to clean it though on a higher price but I prefer to buy cleaned prawns. 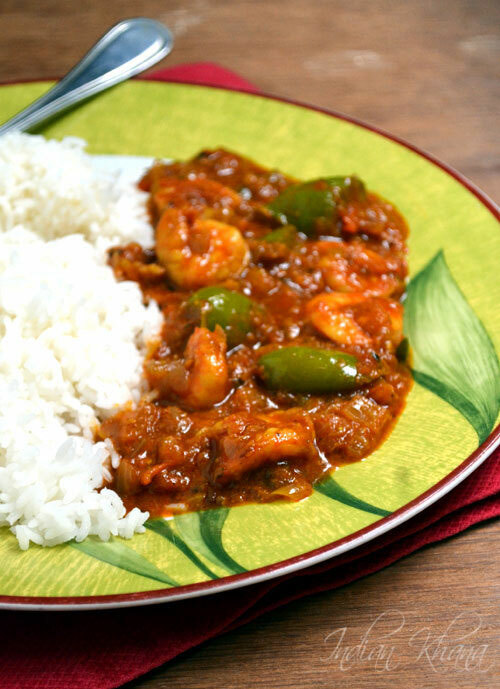 I normally buy prawn in large quantity and freeze half of it for later use, first fresh batch I will make Prawn Masala that's the most favorite and popular recipe of this blog too and the another batch I try new recipes. 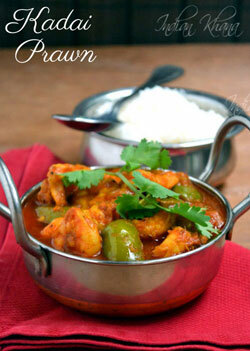 This time I tried Kadai Prawn keeping in mind my Kadai Mirch Paneer and it did taste delicious. 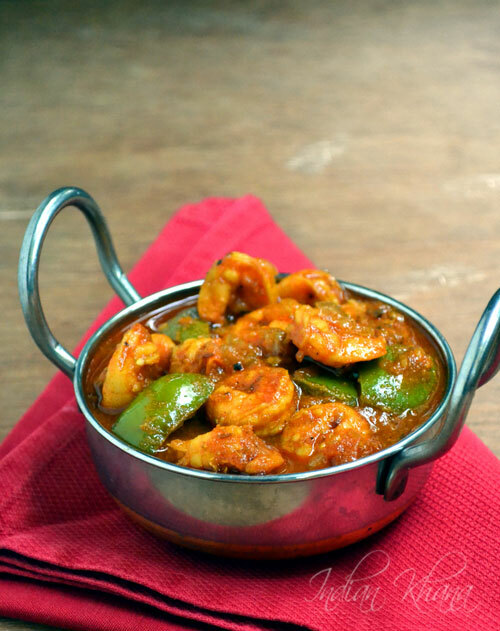 Capsicum adds wonderful flavor to the dish and also makes it more colorful. Now a days I do this prawn and veggie combination a lot one of which I have to post that was just delicious. 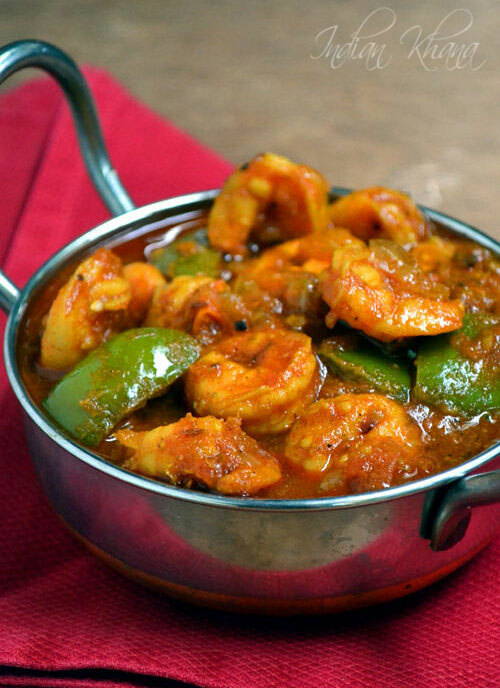 You might find list of ingredients long in this kadai prawn but most of the things we find in our pantry all the times and try not to miss anything each spice adds it's own flavor to the recipe making it delicious. I made this kadai quite some time back but the post was pending for long time until now I decide I better post it, I didn't took step wise picture which now I don't remember why perhaps I can update it some time later. This kadai prawn goes well with plain steamed rice the way I normally like but you can have it with roti, paratha or poori too it's your choice. 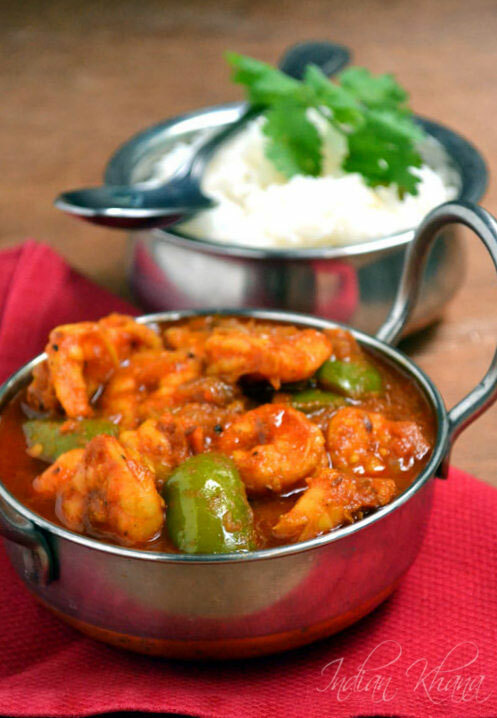 Now while preparing the post I am really drooling and want to make this again, this weekend task going to be get some fresh prawn and make this kadai prawn again, you give a try too and let me know how you liked it. 1. Marinate prawn with 1/2 tsp salt and 1/2 tsp tumeric for 15 mins and rinse well. 2. Again marinate with remaining turmeric powder, salt, red chili, coriander powders and gigner-garlic paste for 15 minutes to until required to use. 3. Finely chop onion, tomato, green chili and coriander leaves/hara dhaniya. 4. In a kadai (wok) heat oil add hing, cumin and allow to crack. Add ginger-garlic paste and saute until light golden brown. 6. Now add red chilli, turmeric powder, coriander powder, pepper powder, cinnamon and cloves powders and mix well cook for 2 minutes. 7. Add prawns, capsicum, salt mix well, cover and cook for 10-12 minutes for until prawn gets cooked. 8. Add garam masala, cilantro and stir well, simmer for a minute and off flame.